Lincoln City has more than 500 vacation rental dwellings and a lack of affordable housing for residents. We began the day talking about the ocean, huddled around the coffee station in the Street Roots vendor office, waiting for a new pot to brew, drip by drip. One Street Roots vendor reminisced about visiting the shore in New York, mentioning she had never been to the Oregon Coast. “I would love to see the ocean,” she said. Other vendors began to discuss how to get there – which bus might take you where. It was a can-do crowd. As we talked, the ocean broke its waves on the sand, as it always does, maybe a blue-sky day on the coast, a seagull diving for a bit of crab meat from a claw left on the shore. I could see it. We were conjuring the ocean together, that place of peace and power. Life is hard for so many people struggling with poverty at Street Roots, and people keep trying. I thought about the ocean much of the day. I’ve lived most of my life in Oregon but spent a handful of years in my 20s on the East Coast, where I was startled by how beaches weren’t necessarily public, that some beaches were walled off for the wealthy. I began to dig deeper to understand how a couple of Oregon governors were key to making beaches public – how Oswald West declared beaches highways in 1913 in order to transfer the land to the public realm, and how Tom McCall helicoptered onto Cannon Beach and drew a line in the sand to declare the edge where public beaches begin, leading to the Oregon Public Beach Bill of 1967. This idea of beaches as a public space in Oregon has a history that involves several dramatic swerves. It could have easily turned out differently. Developers could have made millions by parceling off our beaches. Instead, beaches are a public good. You might wonder where I’m going with this. Ideas have histories, including ideas about what everyone should have a right to, or only an exclusive few. Housing should be the same. How do we make sure that it’s just simply a right to have safe, stable housing in Oregon, that this is who we aspire to be as a state? It’s a guiding principle, not a done deal with one fix. We aspire until it’s who we are. There’s a lot about the midterm election that shows we are swerving in the right direction. We passed the biggest regional housing bond in our history with more than 59 percent of the vote. From Austin to Bellingham to Charlotte, housing bonds passed across the country, as did a range of taxes to support housing and services for people experiencing homelessness. The fact that Oregon’s statewide Measure 102 passed means that towns and cities across the state can put bonds to the voters with expectations that the money for affordable housing will go even further. Throughout the year, Street Roots has reported on the statewide housing crisis from Lincoln City to Ontario, Bend to Junction City, showing clearly the need for deeply affordable housing all around the state. California became a model for a statewide housing bond, passing a $4 billion one. 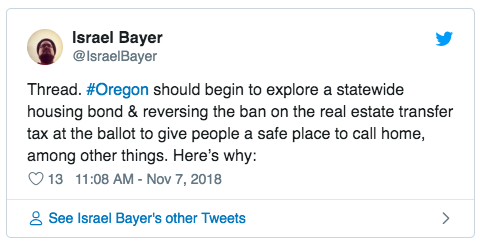 Former Street Roots Executive Director Israel Bayer tweeted out a call for an Oregon statewide housing bond in 2020. Yes, let’s keep reaching. Housing for everyone. We don’t stop until it’s a truth. Imagination is a powerful force for justice. Life is particularly hard for some, and that matters to us all. Let’s keep expanding our vision toward a just city and a just state, where everyone has a right to safe, affordable, stable housing. This idea must inspire us, strong as a pull of a tide, again and again. Please support our mission at Street Roots by contributing to our winter fund drive. We’ve stapled an envelope into the Nov. 16-22 edition so you can mail in donations. Individual donations are the cornerstone of our funding. Thank you!